Our move to rural Kansas came with so many new things-new schools, my husband’s new job, new house, new adventures, and SNOW! We had an abundance of snow during our first winter here. This was our view on multiple occasions. Thank goodness it has been a fairly mild winter this year, though we are in desperate need of rain. Another new adventure included our garden. This is an ongoing and growing effort (pun intended). Last year we started a single raised bed that is 24 feet by 16 feet, and the results were plentiful. 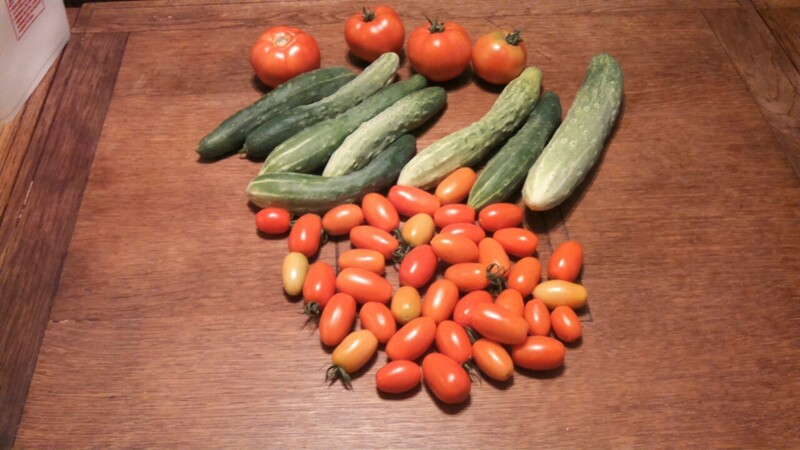 This was an early season harvest, and we were collecting this at least twice a week. We opted for raised beds for two reasons. First, the house and shop area sit atop a ridge that is solid rock. We didn’t want to dig through rock, just to back fill with dirt and manure. 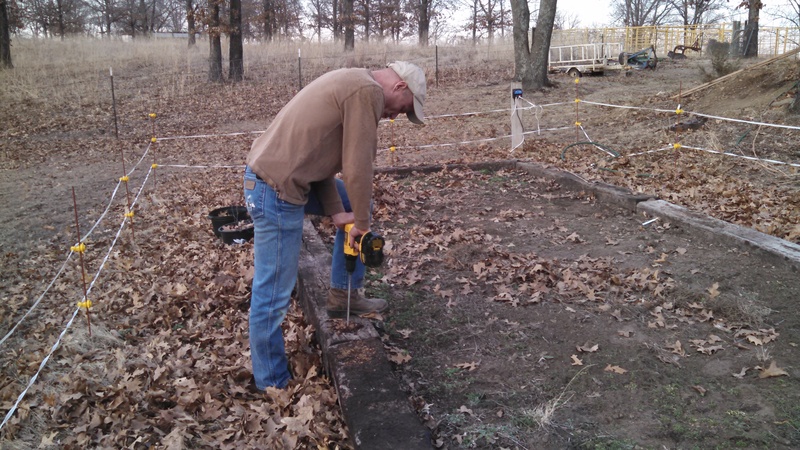 Second, the ground is not level, so raised beds allow us to control the soil level and prevent erosion. We are just getting started with our garden adventures this year, thanks to some late winter weather over the last few weeks and a few tractor repairs. We are slightly behind schedule, but making headway. The first project was to stake down the wood from last year’s garden now that we’ve decided it works well where it is. This meant drilling holes through two levels of wood, cutting Rebar, and driving the stakes into the ground. We are fortunate enough to have a large shop where I can start seeds early. Last year, CAT built me these great work tables. 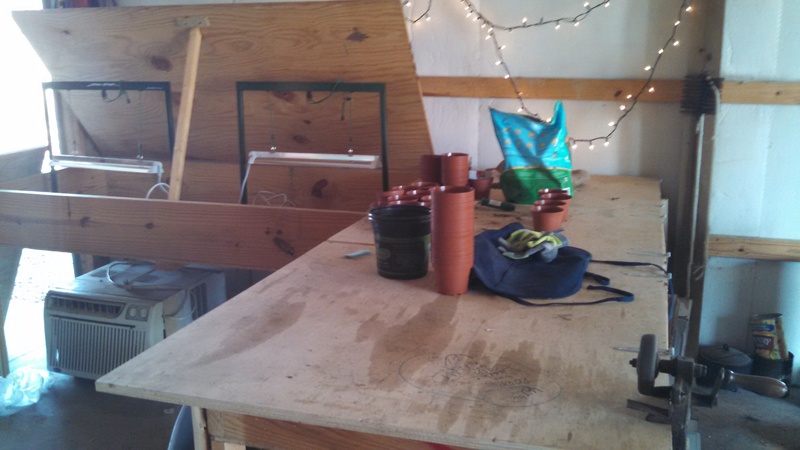 The tops open up for off season storage, or for setting up a green house effect. 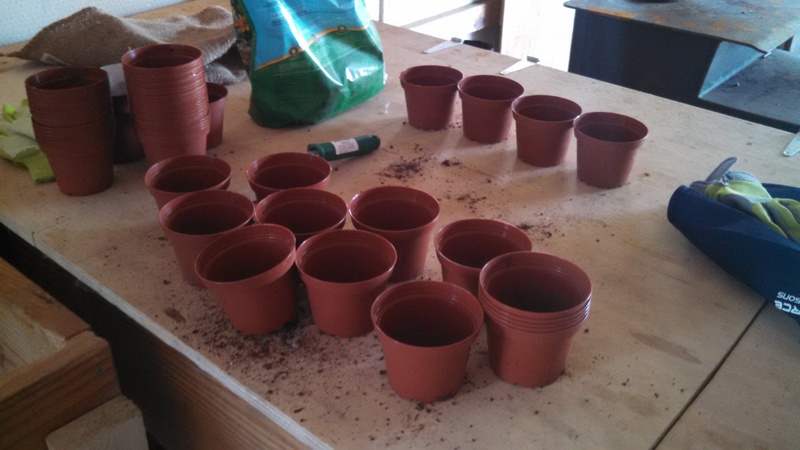 I ordered the small pots from Amazon last year, and I’m able to reuse all of them this year. Cricket and I planted seeds in regular potting soil to get things growing . After the shop cats knocked over many of the planters last year, which caused the Popsicle stick labels to come out of the planters, we are trying a new method this year. 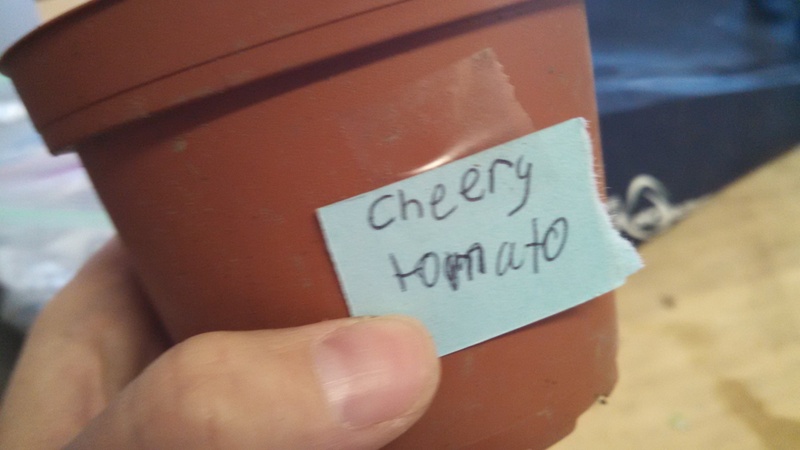 Cricket helped me out so we will have “cheery” tomatoes, rather than cherry tomatoes. Either way, they are bound to be tasty. 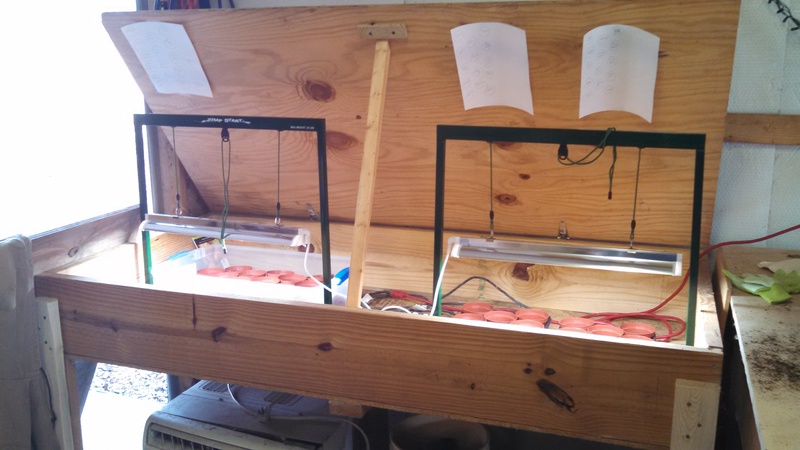 Last year we debated between purchasing growing lights or building our own. With so many projects on the list, we decided to purchase for now. Cricket and I also added diagrams to our setup in case the paper labels got wet and smeared. I hope to build some into the table one day, which would allow me to close the lid over the plants for the first week. 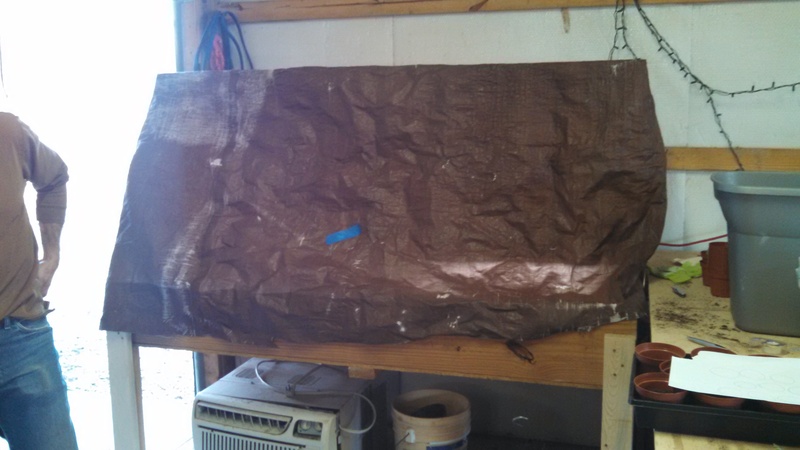 For now, we hang a tarp to hold in the warmth. It seems to work pretty well. Outside, we are expanding to a second bed. 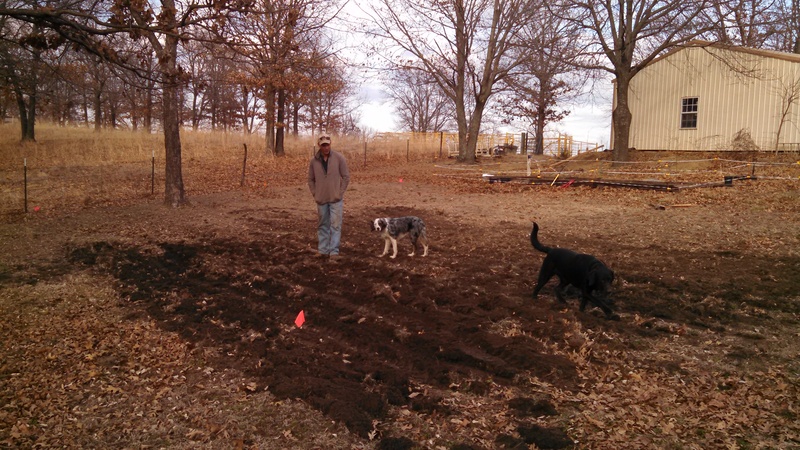 This one will be twice as large as the original bed, which will allow us to harvest the garden from May until October. Our first run gave us fresh produce from May until July. The first step is to plow the ground. We would normally use the big tractor for this, but it’s currently in repair phase. So, CAT and I took turns on the Little Green Monster (a 1962 Sears Suburban 725 garden tractor) to get the ground ready. Cricket is working in the old bed to clear out the weeds that made it through the winter. CAT leveled out a couple of low spots while I finished plowing. 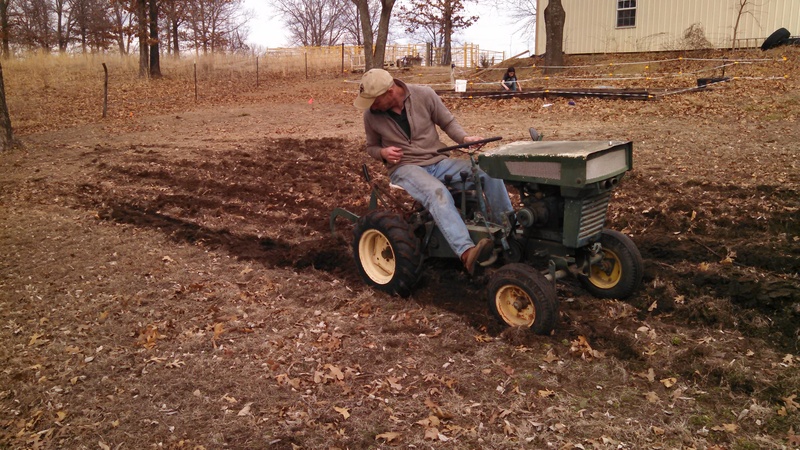 Most of the leveling will happen after we disc the ground. Sophie and Tank helped with quality control. Next up, we disc, bring in the lumbar for side walls, and fill with a mix of manure and dirt. We should have hearty seedlings to put in the ground by mid-April. More to come soon. Meanwhile, we are preparing for Spring soccer and a shop party in April, plus some family visits.